The urban forest of Hailey took a big hit last year when an early ice storm damaged hundreds of trees around the city. As work crews toiled to remove broken limbs and tree trunks, the Hailey Tree Committee began taking a long view on what it sees as key city assets. "Trees are a public asset, just like sidewalks and fire trucks," said arborist and Hailey Tree Committee Chair Jen Smith. Until recently, the city had no means of measuring the values and replacement costs of these assets. Smith, who also works as Ketchum parks superintendent, provided computer hardware support to Hailey in recent months to inventory trees on public property and city rights of way, including city parks. Smith said tree inventories in Ketchum and Hailey are 50 percent complete. She said both cities have so far identified about $1 million worth of trees on public property. "The value of Hailey's trees may end up higher than Ketchum's because they are older," Smith said. 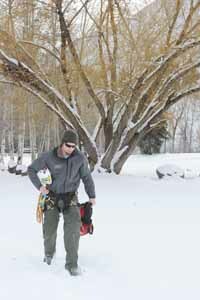 The Hailey tree inventory identified a weeping willow tree in Lions Park in east Hailey valued at $29,400. The most valuable tree identified so far in Ketchum is a $16,000 Engleman spruce in Forest Service Park. Those are the replacement costs the cities have established for the trees in their current condition, based on national standards derived from a formula used already by Smith in Ketchum. The formula takes into account the tree species, its age, removal costs and other criteria. Following a policy used in Ketchum, the Hailey City Council passed an ordinance change this week that will use tree replacement costs when responding to requests to remove a healthy tree on public property for a property owner's private benefit. The council approved a tree removal request procedure for removing healthy trees on city property. The request will trigger a review by the Hailey Tree Committee to determine if the tree should be removed. Smith said the four certified arborists on the Hailey Tree Committee will make a recommendation to the Public Works Department on whether to remove the tree, based on the health and value of the tree and the reason removal was requested. "If the request is for a better view, or for parking or some other arbitrary reason, a face-to-face conversation will have to take place," Smith said. She said neighbors would also be notified and questioned as to their preferences with regard to tree removals. If an applicant is allowed by the city to remove a healthy tree, the person will pay the replacement cost of the tree to the Hailey Parks and Lands Board. The money will be used for planting and maintaining trees elsewhere, including on city rights of way in new developments or in city parks. The council also voted to waive a $50 encroachment fee for property owners willing to trim or remove damaged trees on city rights of way that are dead or pose a threat to private property.